Howard and I cleaned up our room lastnight because the night before last, Howard thought he heard that mouse. Remember the mouse? This is how abject I have gotten. I sleep peacefully even with rodents in the room with me. I did not wake up one second! But I guess Howard did, and he lay there in the darkness listening to this mouse do whatever it was it was doing. Which, lastnight we found out what the mouse was doing. There was a little pile of gnawed-up plastic -- a plastic bag, or something. It was all mounded in a corner that had been hidden behind a bookshelf. That was something it mattered to the mouse to take care of, something that was on its agenda. It was a mouse WPA project! Now the room is tidied up and today we will attack under the bed and then we will be sitting pretty with no mouse because there will be nowhere for it to go. Along the way we found treasures. Howard found a gift card for Premier that we can use to buy bourbon. I found a bunch of Symphony magazines I did not know I had, which made me happy even though they never mention Leonard Pennario, for which fie on them, fie. Thus our spring cleaning has begun. It is long and onerous! I envy my friend Gary whose immaculate house you can read about here. Gary is a single guy and he makes extra money by taking in tenants, mostly UB grad students. He has lucked out recently with a student from Westchester County named Sean. Normally Gary draws the line at American students. He likes the foreign students because the foreign students have a better work ethic in general and are more likely to be studying, not partying. Once Gary had a roommate named Hamed who was from Iran and was studying medicine. Hamed once studied at the hospital for three days! Then he went home and went to his room and slept for three nights! Without ever getting up! Gary was worried about him. We love Hamed. Gary keeps in touch with him and when Hamed comes over we kid him about that. But this Sean, he is from Westchester County and it is as if he fell out of the sky. He buys cleaning supplies as if by wholesale. Just last week Gary said Sean came home and asked: "Gary, where can I put all these cleaning supplies?" Sean set up shop immediately in the bathroom where he polished everything to a high gloss and installed an air freshener. Once, Gary awoke and all the rugs were gone. They were down in the basement. Sean was shampooing them! Imagine if I had married a man like Sean! My life would be different, that is for sure. 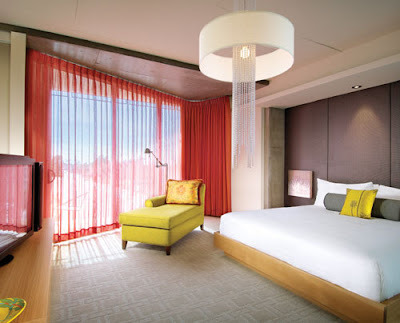 The bedroom would look like the bedroom pictured above. I found it on the Direct Buy site, captioned "Manufacturer-Direct Master Bedroom." It is fun to look at pictures of bedrooms. Here is a modern bedroom. I would burst into tears if I came home to this, I have to say that. It looks like one of the UB libraries! 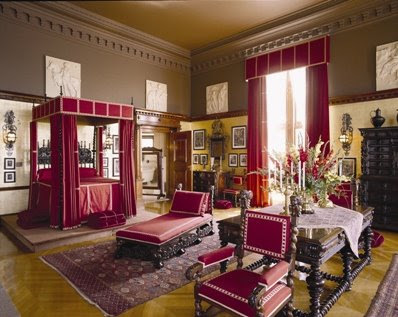 Here is a picture of George Vanderbilt's bedroom at the Biltmore House. Here is a spring bedroom. Here is Mozart's beautiful 27th piano concerto so you can see how he quoted his song about May, the one I linked to just now. This concerto is so lovely but there is such a sadness about it. They say that Mozart could not have known it would be his last piano concerto but I think he did, I am sorry. 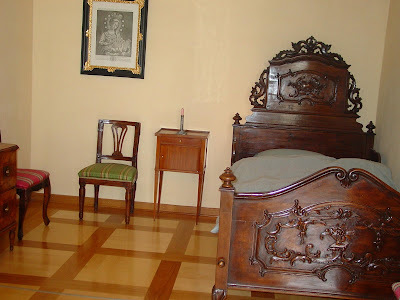 Here is a picture of Mozart's bedroom. At least that is what a travel blogger says. Who knows. The picture is in a collection called "Munich" so maybe this is where Mozart stayed when he was in Munich. It does not look as if he would have had a mouse problem. Wow, how sweet! I am watching that video, the piano concerto video, and they give a little presentation at the end of the performance, explaining just what I was talking about! It is a good performance, by the way, by a pianist I have never heard of. You have to laugh, though, at the apprehensive look he gets as he prepares to face this piece. It is like me, confronting the clutter under the bed! Those are some great shots of the various bedrooms. I like the one on top the best. Hi Stephen and welcome.